All of your items will be securely sealed and stored in the mall by our staff, along with your contact information and delivery preferences. 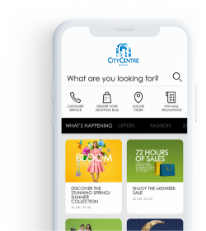 Have your bags brought to you anywhere, at your convenience, by using the City Centre mobile app or calling our team 15 minutes before you finish shopping. You can also use the fetchr app to request a delivery. The service is completely free of charge for deliveries made inside the mall, to your car, or to hotels connected to the mall. We also offer home delivery priced at AED 30 for same day deliveries, and AED 18 for next day deliveries. For assistance or more information call 04 801 8188. Hands Free Shopping service will be available during City Centre Mirdif (the ‘Mall’) trading hours. Hands Free Shopping service is complimentary for in-mall deliveries and the hotels connected to the Mall, for a same day in-mall delivery and for an unlimited number of bags dropped per registered customer. The Mall reserves the right to not accept any shopping item, including food, beverages, perishable items, groceries items, flowers, delicate or breakable objects, prescription drugs, money or cash, jewelry, precious metal and watches, personal belongings, live animals and any items that are illegal under United Arab Emirates Law. All customers’ shopping bags must be sealed in the dedicated Hand Free Shopping delivery bag in the presence of the customer. The Mall reserves the right to decline the acceptance or collection of any bag that is not sealed or wherein the seal is open. The weight of each Hands Free Shopping delivery bag shall not exceed 5 kg. The size of each customer’s shopping bag(s) shall not exceed the dimensions of the Hands Free Shopping delivery bags. Shopping bags not collected within 10 days will be disposed of according to the Mall’s management policies. The Mall will aim to deliver to the customer the Hands Free Shopping bags within 15 minutes after customer sends the notification for collection to the Mall’s Hands Free Shopping service team. The Mall cannot guarantee this time period and do not accept liability in case of any delays. The Mall shall neither be held responsible nor liable for the loss or damage of any bag or items dropped or collected for the Hands Free Shopping service. Order creation cut-off: 6:45 PM. Deliveries will take place between 8:00 PM to 11:00 PM. Same day delivery is available all 7 days of the week. Order creation cut-off: 7:45 PM. Deliveries will take place the next day between 9:00 AM to 2:00 PM and 2:00 PM to 6:00 PM. If an order is not scheduled by 8:00 PM on the same day, it will be sent to customer service for scheduling. Next day delivery is available 6 days a week except for Friday & public holidays. *We do not offer delivery in the following regions - Moreeb Hills, Zarrarah; Bin Thilab, Gharab; Al taff, Bid Khabbab; Al Janai; Al Hudairiyat Island; Balrmad Island; Mushayrib Island; Nareel Island; Samaliyah Island; Sas Al Nakhl Island; Umm Yifenah Island; Al rafiq, Qassabi; Zeraa Island.